Since my last post on the strike, where I set out my reasons for not joining it, a lot has happened. The strike has forced UUK back to the negotiating table, overseen by ACAS, on a deal originally presented as done. The consultation period on the new arrangements has been postponed. University Vice Chancellors are scurrying to distance themselves from the UUK negotiating position and side with their own striking lecturers. 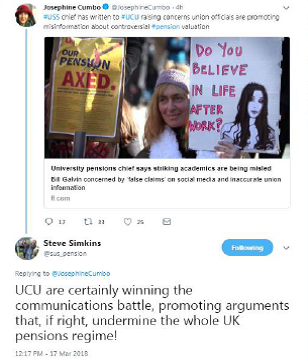 As most observers admit, including most recently the Head of Public Sector Pensions at KPMG in the tweet below, the UCU have won the communications battle. Victory appears to be total. However there remains a problem, which we seem to be facing increasingly in recent years from Trump to Brexit, and that is this: what to do when the victory you have won is based on campaign arguments which are fundamentally untrue, not backed by evidence or existing pensions legislation, and ultimately undeliverable? Just keep saying no to any workable option which is put to you? The trustee regularly monitors the scheme’s funding position as part of the overall monitoring of FMP introduced followed the 2014 valuation. The monitoring is based on the assumptions used for the 2014 actuarial valuation (updated for changes in gilt yields and inflation expectations). The monitoring does not involve the same detailed review of the underlying assumptions (including the financial, economic, sectoral assumptions for example) that takes place as part of the full actuarial valuation, the next full actuarial valuation being due as at 31 March 2017. Therefore the amounts shown for liabilities in the funding position below are not indicative of the results of the 2017 valuation. So arguing about these assumptions was futile. The letter also showed an unexpected lack of understanding (particularly from Steven Haberman, who must have spent enough time in the company of pensions actuaries who carry out these kinds of negotiations all the time to know better) about what the assumptions shown in the accounts meant. In particular, there is a note saying that the general salary assumption is only being used for the recovery plan contributions rather than to calculate the scheme deficit. That means that, if you think the assumption is too large, it will be overstating the value of future contributions and therefore understating how large those contributions need to be. So rather than making the scheme seem more unaffordable, it would be making it seem less. Then there is the mortality point – a massive misunderstanding. The assumptions do not say that life expectancy is increasing by 1.5% pa which would clearly be absurd. They are saying that mortality improvements (ie the percentage by which the expected probability of death of a 70 year old in 2020 is less than that of a 70 year old in 2019) are assumed to be 1.5% pa. Stuart McDonald gently put Ben Goldacre right on this point here. However the bigger overall point is that individual assumptions are not the thing to focus on here anyway, but the overall level of prudence or otherwise in a basis. And the facts around this are considerably clearer. We know that the initial valuation proposed by the USS Trustee to the Pensions Regulator and the covenant assessment on which it was based (ie the willingness and ability of the employers in UUK to continue paying contributions) were both rejected. As this initial valuation disclosed a deficit of just over £5 billion, then the proposal resulting in a £7.5 billion deficit which was finally presented to the Joint Negotiating Committee would appear to be as low as the Trustee could reasonably go and still get the valuation past the Regulator. The S179 valuation of the scheme (this is the valuation all occupational pension schemes who pay levies to the Pension Protection Fund as insurance against the failure of their employer(s), which is done on the same valuation basis for all schemes) at the last valuation as at 31 March 2014 showed a deficit of £8.95 billion (compared to the £5.3 billion funding deficit disclosed). 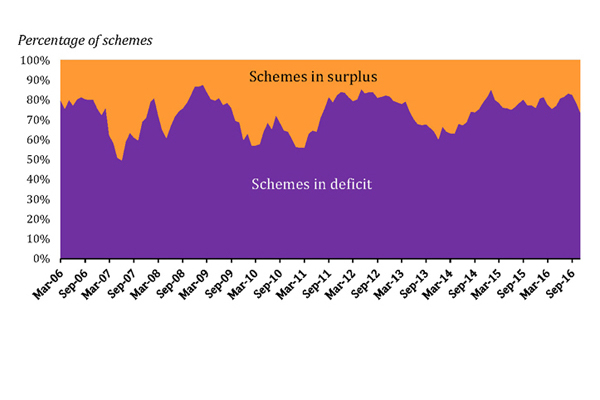 The latest “more prudent” valuation proposed is therefore still unlikely to be proposing a target which goes anywhere near 100% funding on this basis (the scheme was only 82% funded in March 2014 when, as you can see below, nearly 40% of schemes were in surplus on this measure). There is therefore no justification for the repeated assertion by the UCU that the scheme is not under-funded. One last point on the campaign. Some of it seems to have been directed personally at the USS Trustee. This is the body with no other job than to protect the security of the pensions that lecturers have already built up. Why would anyone want to turn on them? Bill Galvin, the Group CEO at USS Ltd, the Trustee company, has set out responses to some of the other misconceptions here. I would urge anyone with an interest in this dispute to read them. So, if the deficit is what it is and there is no scope for weakening the funding assumptions any further and maintaining current benefits on these funding assumptions involves contribution increases which are unacceptable to both scheme members and the employers, what is this dispute about now? The time has come for lecturers to decide what they want. Of course the basic premises of pension scheme funding can be argued about (and I direct anyone interested in the long history of actuarial debate in this area to read chapter 6 of Craig Turnbull’s A History of British Actuarial Thought which traces this from 1875 to 1997), and perhaps ultimately legislative change might be brought about if a new argument could be won in this area. But that is a long term objective and the funding of this scheme needs to be agreed now. If a £42,000 cap for 3 years while negotiations continue on a long term structure of the scheme which doesn’t leave all risk with scheme members is not acceptable, then we need to decide pretty quickly what is. Because once we move to a DC arrangement, the chances of us moving back to any form of risk sharing subsequently are in my view remote. There will always be other uses for that money. However there are many possible alternative structures and many ways of sharing the risks between employers and scheme members. In particular let’s not get too obsessed with Collective Defined Contribution schemes, the enabling legislation for which has yet to materialise. Consider all the alternatives and let proper negotiations commence! While the NHS has been asked to find £22 billion in savings by 2020, the latest figures from the Student Loans Company show that over £13 billion has been found to fund student loans for 2016/17 alone, without increasing the Government’s deficit and without appearing in the Public Sector Borrowing Requirement until some time in the 2040s. How is this possible? The key difference is that the money the Government provides in student loans are seen as just that: loans. However, unlike any other kind of loan (and the reason that commercial banks declined to join the SLC – which was the original plan and the reason it was set up with a company structure), only between 40 and 45% is expected ever to be repaid, the repayment term is limited to a maximum of 30 years and the payments limited to a percentage of earnings above a minimum earnings threshold (which is about to increase to £25,000 pa). It is in reality a graduate tax masquerading as a loan, with the “sticker price” of £9,250 pa (which is of course a real price for overseas students) just used to ensure students don’t feel like they are paying this tax on someone else’s behalf. However the payments made by the Government since 2011 as “loans” have not led to any outcry about uncosted commitments, or passing the bill onto future generations which you might expect. Which is surprising, as it has meant that Higher Education has effectively been allowed to sidestep the austerity policies applied to just about every other Government department completely. One might think that the architect of such a scheme would be quite popular within the Higher Education space. Far from it. Since the announcement of his appointment as the new Chancellor at the University of Leicester, the Leicester branch of the UCU has widened the campaign it is already running against the Joint Negotiating Council’s decision to close the USS pension scheme to further defined benefit accrual to embrace a #WillettsOut position. 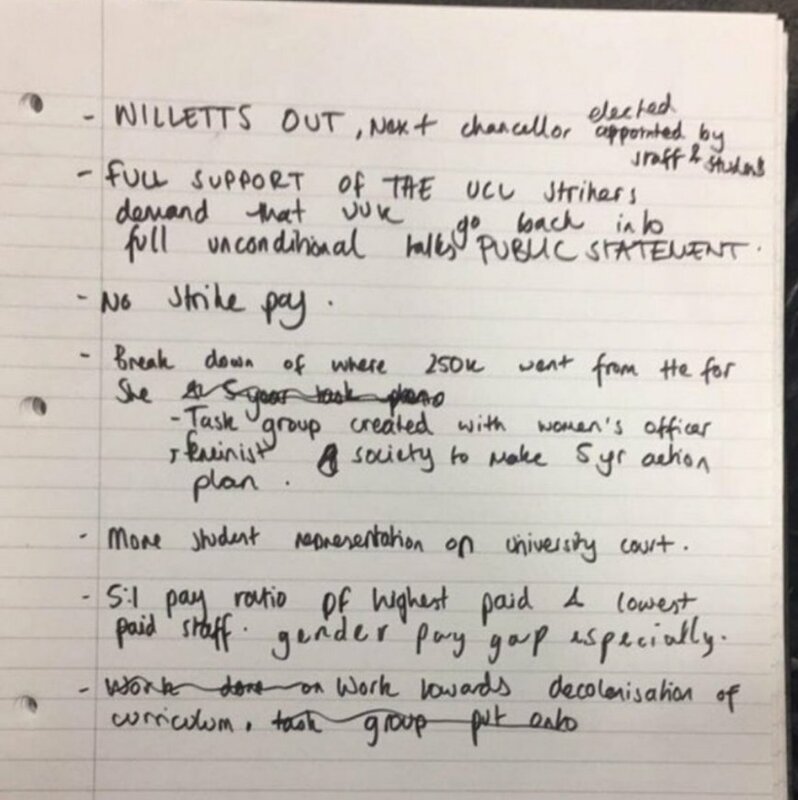 The students who occupied the corridor outside the Leicester VC’s office for two days similarly had Willetts’ removal on their list. Apart from elements of his voting record (he was strongly in favour of an elected House of Lords and was strongly against the ban on fox-hunting. TheyWorkForYou additionally records that, amongst other things, he was strongly in favour of the Iraq War, strongly in favour of an investigation into it, moderately against equal gay rights, and very strongly for replacing Trident), the main charges against him seemed to date from an article about him in the Guardian from 2011. Now without minimising the differences of opinion which I and many of my colleagues will clearly have with David Willetts on a wide range of issues, I do think we are in danger of surrounding ourselves with the comfortable cushions of like-minded individuals all equally in the dark about the regulatory changes in store for us and at risk of all the worst consequences of Group Think. I would therefore like to put forward an alternative view. The University of Leicester is facing, along with the rest of the Higher Education sector, serious challenges over the coming decades in response to an expansion of the proportion of young people going to university which no political party is going to want to reverse (and which I, for one, would not want them to). David Willetts was the chief driver of much of these reforms and has a clear vision of what they are trying to achieve, set out in his book A University Education. He is currently a visiting professor at King’s College London where he works with the Policy Institute at King’s, a visiting professor at the Cass Business School, Chair of the British Science Association, a member of the Council of the Institute for Fiscal Studies and an Honorary Fellow at Nuffield College, Oxford. However his real passion is around social mobility, something which I believe is important to many of us here at Leicester, and which has led him to a role as Executive Chair of the Resolution Foundation. As a former cabinet minister and shadow cabinet minister from 1996 until 2014, Willetts is very well connected, a formidable debater and would make a fierce friend of the University, fighting Leicester’s corner in what is likely to be an increasingly challenging period. David Willetts would undoubtedly bring significant challenge with him. Arguing with him (I watched him in debate with Stefan Collini and a variably outraged university audience at the Senate House last year) can sometimes feel like doing battle with a hammer. But it may be that this is what we need to respond successfully to the new world which is coming rather than yet another comfortable cushion to make us feel better. Let’s welcome him inside the tent. This is a piece largely written as a rebuttal to Waseem Yaqoob’s recent article on the LRB blog, entitled Why We Strike. Let me start by clearly stating that I support the University and College Union’s (UCU’s) right to strike from Thursday, and think it is ludicrous that 7 of the 68 ‘pre-92’ universities’ UCU groups need to reballot their members before they are allowed to carry out what is clearly the majority view of their members. I just think they are wrong this time. The Joint Negotiating Committee (JNC – apologies there are lots of acronyms in this) of the Universities Superannuation Scheme (USS) is the body tasked with negotiating the pension deal struck every 3 years. It has equal numbers of members from Universities UK (UUK – representing the employers (over 390 of them)) and the UCU, with an independent chair who gets to cast the deciding vote on matters when the other JNC members are in deadlock. Just such a deadlock occurred over the future of the USS. The UCU representatives wanted to continue with some sort of defined benefit (DB) arrangement, where benefits are guaranteed, and the UUK representatives wanted to switch to defined contribution (DC), where contributions are instead paid into an invested fund for the member to secure benefits with as best they can at retirement. The chair went with the UUK position. As a member of the USS as a result of working as a lecturer at the University of Leicester, I fervently hoped for a different outcome for purely selfish reasons. However I could not justify why I should have a DB pension (which I agree is a vastly superior option to the DC alternative being offered) when the vast majority of DB schemes are already closed, including let’s not forget the University of Leicester Pension and Assurance Scheme, which has been closed to new entrants since 2003 and to future accrual since 31 March 2016. Is it realistic or reasonable to assume that Grades 6 and above will continue to enjoy DB accrual indefinitely while Grades 5 and below don’t? example, the top universities in the United States mainly have DC pension schemes. The rationale for the changes is not dubious. The vast majority of DB pension schemes follow the same funding approach as the one used by the USS which has revealed such large deficits, as was recently confirmed by research carried out by Punter Southall. Most research points to a gilts plus basis being the most appropriate for a scheme still open to future accrual. Make recovery plans of more than 10 years exceptional (the USS currently have a recovery plan of 17 years, 14 of which are still outstanding – reducing this to 10 would considerably increase the contributions required into the scheme). It did not focus on valuation methods particularly. However the resultant green paper, which launched a consultation which ended in February 2017, considered 6 questions, the first of which was focused on whether current valuation measures were the right ones. Unfortunately the detailed discussion (eg in paragraph 213) was hardly encouraging to the view that the USS funding basis is too prudent and the contribution requirements too high, as it suggested that stricter interim funding targets be set for schemes which were severely underfunded and gave an example of what they meant by this as being less than 100% funded on the Pension Protection Fund (PPF) basis (this is the pensions lifeboat for schemes with insolvent employers – USS was 82% funded on the PPF basis at the last valuation). One point where I am in agreement with Yaqoob is that the success of the strike will depend to a large extent on how students respond. I was amused by the admission that “Students have expressed solidarity with striking staff while at the same time demanding refunds for their disrupted education”. I believe that the solidarity with striking staff is due to misinformation, whereas the demand from students for refunds for their disrupted education are likely to be more long-lasting. I have resigned my membership of the UCU as a result of this ill-conceived strike action. I urge other members who feel a similar discomfort about what they are being asked to do to consider whether they need to do the same. What if we made the State Pension Age irrelevant? The State Pension age should continue to be universal across the UK, increasing over time to reflect improvements in life expectancy. The State Pension age should increase to age 68 between 2037 and 2039.
no exceptional changes to the data used). Individuals should get 10 years’ notice of any new changes to State Pension age. that means-tested access to some pension income will remain at 67 and will continue to lag a year behind for rises thereafter. that the conditionality under Universal Credit should be adjusted for people approaching State Pension age, to enable a smoother transition into retirement. 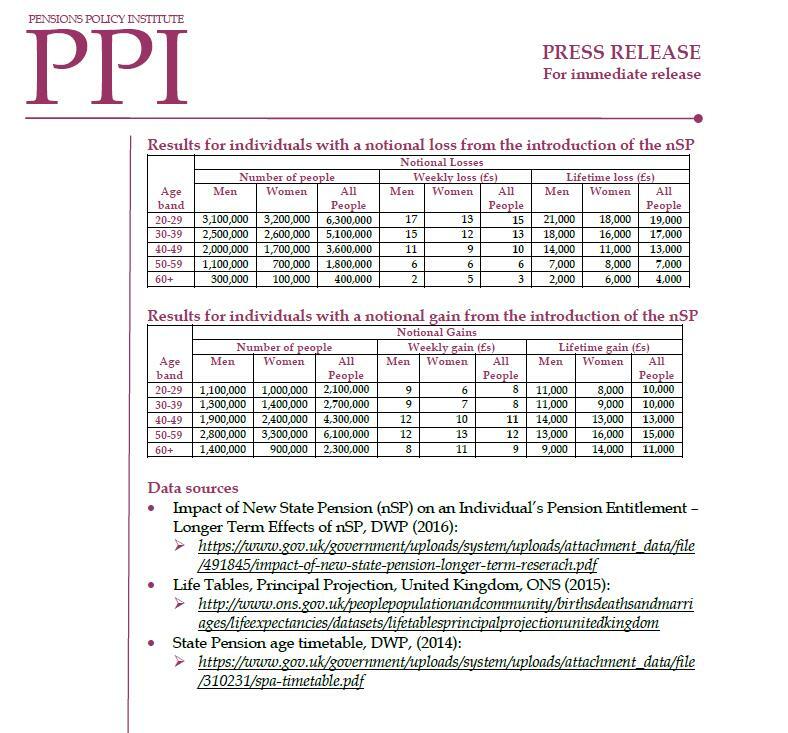 Other commentators have given their analysis, some, like the Work and Pensions Parliamentary Select Committee, have pointed out that many people will not live to see the new SPA, something rather lost in the massive groupings Cridland referred to where the lowest average was across a group titled “Routine”. These were described as socio-economic groupings but seemed in reality to be more occupational. There is some reference to healthy life expectancy, but no attempt to quantify how this varies by population. It therefore gives the rather misleading average of around 10 years of healthy life expectancy at age 65 for both men and women. 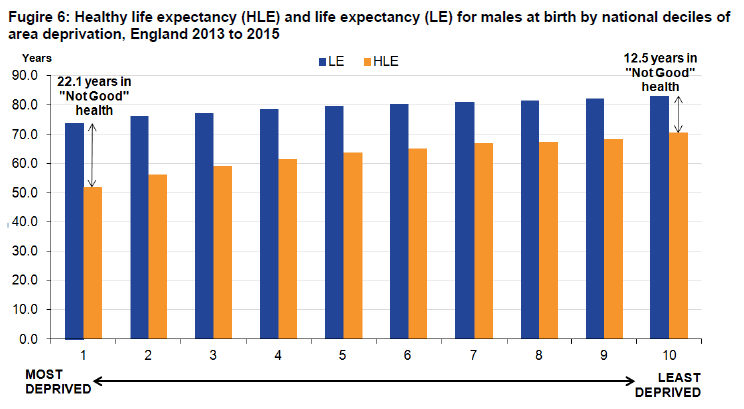 The graphs are more encouraging for women in terms of life expectancy, but no more encouraging for healthy life expectancy. People will not contribute to other savings vehicles if they think these will just reduce benefits elsewhere. This was how the Minimum Income Guarantee killed the Stakeholder Pension. Many people do not claim means tested benefits which they are entitled to. Whether through pride or fear of the dauntingly long forms the DWP produce for any claimed benefit or a combination of the two, a study in 2003 indicated that 1 in 6 people did not claim benefits representing over 10% of their total income. I therefore think there has to be another way, and I think it might be a form of universal basic income (UBI). Compass have produced one of the more recent reports on the feasibility of this, and there are many different forms, with full schemes or pilots now running mainly at a regional level at present in the United States, Canada and India amongst other countries. The basic features of most of these schemes are that the personal allowance is abolished in favour of a regular income paid to everyone, perhaps with different rates at different ages but not means tested. Different schemes make different adjustments to existing taxes and maintain different combinations of existing benefits, both means tested and universal. Compass have modelled five possible schemes, and believe that paying a lower UBI but leaving in place the current means-tested benefits system while reducing households’ dependence on means testing by taking into account their UBI when calculating them may be a feasible way forward. Many people think their jobs are useless and that they are trapped in them with no marginal income to let them transition to something more meaningful. Neither does it seem as if getting everyone into work is good for us physically, further exacerbating the healthy life expectancy problem at lower deciles. I am therefore surprised that there is not more research into feasible UBI schemes. The reference section at the back of the Compass report was shorter than that in many of my 3rd year undergraduate dissertations, and yet it is clearly an area in urgent need of some modelling. Anyone out there fancy joining me in a working party to look at this? The Institute and Faculty of Actuaries (IFoA), through its Actuarial Research Centre, is inviting research teams and organisations to submit proposals for a research project on modelling pension funds under climate change. The research is intended to address the need for pensions actuaries to understand the potential magnitude of climate change impacts, and hence if and when climate change might be relevant to the funding advice they give. What areas in particular might be useful to look at through the lens of a pension actuary? Here RCPs stand for Representative Concentration Pathways, and are meant to be consistent with a wide range of possible changes in future anthropogenic (i.e. human) greenhouse gas emissions. RCP 2.6 assumes that emissions peak between 2010-2020, with emissions declining substantially thereafter. Emissions in RCP 4.5 peak around 2040, then decline. In RCP 6.0, emissions peak around 2080, then decline. In RCP 8.5, emissions continue to rise throughout the 21st century. What this means is that the best we can hope for now is a scenario somewhere between RCP 2.6 and RCP 4.5, with the US Government’s Environmental Protection Agency appearing to believe that RCP 6.0 is the most realistic scenario. As you can see, RCP 4.5 assumes an eventual equilibrium at around 500 ppm, or about 180% of pre-industrial levels and RCP 6.0 an equilibrium at around 700 ppmv, or about 250% ppmv. Release of greenhouse gases begin to alter the oceans. May render some parts of southern oceans toxic to Ca CO3 and thus to one of life’s essential building blocks, plankton. Heatwaves like 2003 which killed 35,000 people in Europe and led to crop losses of $12 billion and forest fires costing $1.5 billion will occur almost every other summer. From Nebraska to Texas the anticipated drought would be many times worse than the 1930s “dust bowl” phenomenon. Polar bears would probably become rapidly extinct. Mediterranean countries will become drier and hotter with significant water shortages. IPCC estimate sea level rise of 18 to 59 cms. Monsoons would increase in India and Bangladesh leading to mass migration of its populations. International food price stability will have to be agreed to prevent widespread starvation. Africa will be split between the north which will see a recovery of rainfall and the south which becomes drier. This drier southern phase will be beyond human adaptation. Wind speeds will double leading to serious erosion of the Kalahari desert. The Himalayan glaciers provide the waters of the Indus, Ganges and Brahmaputra, the Mekong, Yangtze and Yellow rivers. In the early stages of global warming these glaciers will release more water but eventually decreasing by up to 90%. Pakistan will suffer most, as will China’s hydro-electric industry. Australia will become the world’s driest nation. New York will be subject to storm surges. At 3° sea levels will rise to up to 1 metre above present levels. In London, a 1 in 150 year storm will occur every 7 or 8 years by 2080. Hurricanes will devastate places as far removed as Texas, the Caribbean and Shanghai. A 3° rise will see more extreme cyclones tracking across the Atlantic and striking the UK, Spain, France and Germany. Holland will become very vulnerable. By 2070 northern Europe will have 20% more rainfall and at the same time the Mediterranean will be slowly turning to a desert. The IPCC in its 2007 report concluded that all major planetary granaries will require adaptive measures at 2.5° temperature rise regardless of precipitation rates. US southern states worst affected, Canada may benefit. The IPCC reckons that a 2.5° temperature rise will see food prices soar. Population transfers will be bigger than anything ever seen in the history of mankind. Three degrees obviously needs to be avoided, let alone ten, but the problem is that business as usual for the finance industry may not be the way to get there. As some recent research has suggested, financial market solutions to environmental problems, such as carbon trading, may be ineffective. As the authors state: By highlighting the tenuous and conflicting relation between finance and production that shaped the early history of the photovoltaics industry, the article raises doubts about the prevailing approach to mitigate climate change through carbon pricing. Given the uncertainty of innovation and the ease of speculation, it will do little to spur low-carbon technology development without financial structures supporting patient capital. Patient capital is something developed economies have been seeking for some time, whether it is for infrastructure investment, development projects or new energy sources, and no good way to create it within the UK private sector has been found yet, including various initiatives to try and get an increase in pension scheme investment in infrastructure projects. It therefore seems to me to be the wrong question to ask what impacts climate change are likely to have on the assumptions used for pension scheme funding, when it is the impact of the speculation which pension scheme funding encourages which is one of the main drivers of our economies towards the worst possible climate change outcomes. A more productive research question in my view would be to bring in legislators and pensions lawyers as well as environmental scientists and others researching and thinking in this area alongside actuaries to look at how we could change the regulatory framework within which pension scheme funding and investment within other financial institutions where actuaries are central takes place. There is already research into what changes may be necessary to international law to reflect the new Anthropocene era the planet has entered, where the dominant feature is the impact of human activity on the environment. In my view this should be extended to the UK legislative and regulatory landscape too. Let’s forget the strapline of this blog for a moment and assume that the models are correct. The Pension Protection Fund (PPF) is targeting “self-sufficiency” by 2030, ie no more levies from sponsors of pension schemes required for it to independently fund all the future benefits of every scheme member whether they are already in the PPF or going to end up in it with only the insufficient assets their former employers allocated to their former pension schemes for company. BHS has concluded a very high profile deal in the last couple of weeks to set up a new self-sufficient scheme for its former employees. The Universities Superannuation Scheme (USS) has proposed a funding plan which targets self-sufficiency less a “covenant” (ie amount of money feasible to get out of the university sector in the future) by 2031. John Ralfe mentioned a few other examples in his article from 2015. 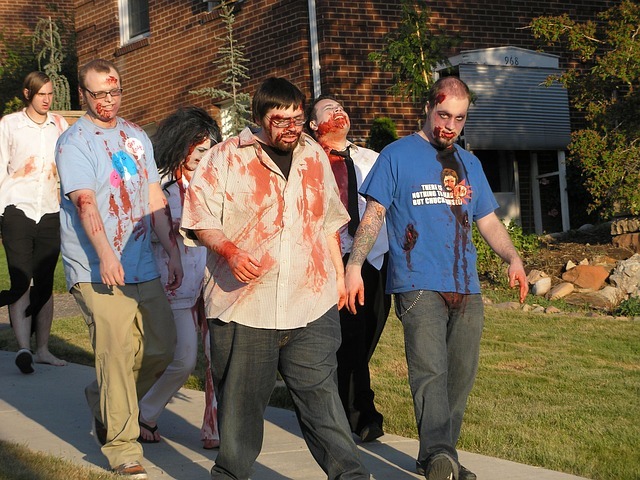 These are schemes which have been dubbed “zombie” schemes on the basis that they are basically dead, with no new money or new members coming in, but nevertheless dragging themselves along the floor year after year until all of their members have stopped twitching. This does not sound like a happy place for our zombies to be negotiating with the occasional limb getting torn off as multiple doors are slammed in their faces. Although the self-sufficiency route is now a common approach amongst large schemes, it is largely untested. No scheme as far as I am aware has actually managed to run in a self-sufficient manner for any appreciable length of time, whereas the more expensive buy out route (where the benefits for members are purchased in the form of contracts with an insurer) is by comparison well established. So off into this volatile landscape our zombies will be let loose, trying to run themselves like little insurance companies, but without the scale or diversification or experience which makes insurers (mostly) survive for long periods. However that better track record comes at a price which schemes are currently reluctant to pay. There is a good chance that this experiment will not end well. My guess for 2030? That the volatile landscape will have claimed some casualties amongst the self-sufficient zombies and put them into the PPF with much bigger deficits than if they had gone there straight away. And then all the other zombies will T-U-R-N A-R-O-U-N-D V-E-R-Y S-L-O-W-L-Y and follow them there. 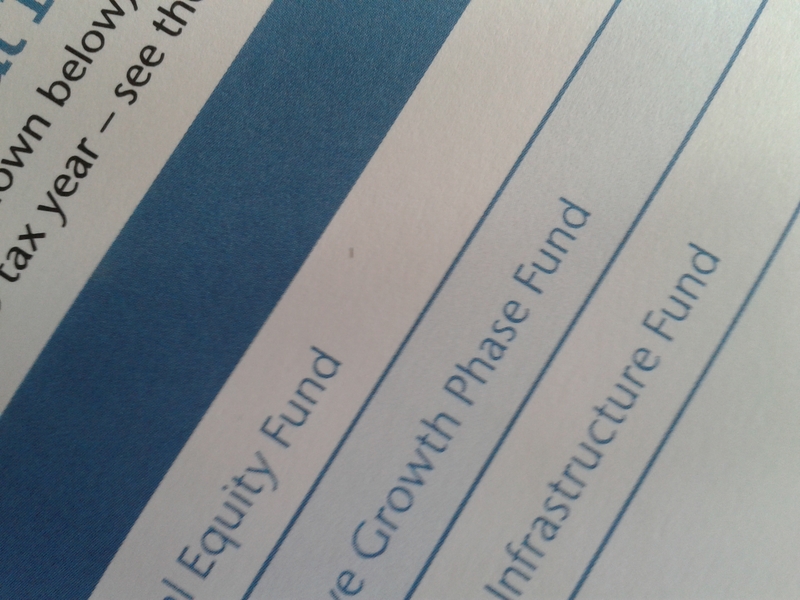 At which point the PPF will realise that they are undead no longer. Today I am going to talk about politics and how we tend to approach it. When I was working as an actuarial consultant we had a client who wanted to write to the local MP about how the Pension Protection Fund levy his company were paying on behalf of their admittedly poorly funded pension scheme was endangering the viability of the business itself. Our view was that it would do no harm and the letter was sent. Nothing came of the complaint, not that we had expected anything would, but the letter was responded to. And so have my letters both times I have written to my MP in a personal capacity, one of them even came back with a Minister’s letter enclosed with it. One way of looking at this is that it is fantastic. It shows democracy working for individuals and businesses at a local level about the issues they care about. A kind of democracy service. This is certainly how we are encouraged to think of it. However another way of thinking about it is that this is just bonkers. To understand this, consider some numbers. There are not nearly enough GPs, according to the latest of many similar reports of a “looming health crisis”. How many full-time equivalent GPs are there per 1,000 patients per practice in England? 0.58, meaning that on average there is 1 GP for every 1,724 patients. GPs frequently complain that the standard 10 minute consultation this necessitates is not enough time to fully explore their health. speak at an event concerning an issue. for each and every one of his or her constituents and their businesses, as the blurb suggests. “These steps can often go a long way to providing a solution” it adds helpfully. If we were all to take up this suggestion of course, the system could not cope. And it cannot, by definition, be fair: a 92,000th of the power of an MP, even if it’s the PM, is probably not worth having in your corner, so the process MP’s use to decide who to help becomes a postcode (or, in reality, power) lottery on a much grander scale than anything we might be concerned about in the NHS. So beware of MPs who say that their minds have been made up on an issue by what can only ever be anecdotal contact with their constituents at best. Even when most of us don’t bother our MPs, they are still inundated with a level of enquiries, most misdirected, that makes it very hard for them to keep up with their parliamentary work. So it is perhaps not unreasonable to suggest that an entirely parliamentary approach to doing politics might not be the only option. And now the Labour Party are exploring this idea in the current leadership election. To the side now coalescing around Owen Smith, Corbyn’s policy-making on the hoof and lack of organisation and discipline at times makes him unfit to lead a party set up in 1906 to promote “socialism via parliamentary means”. 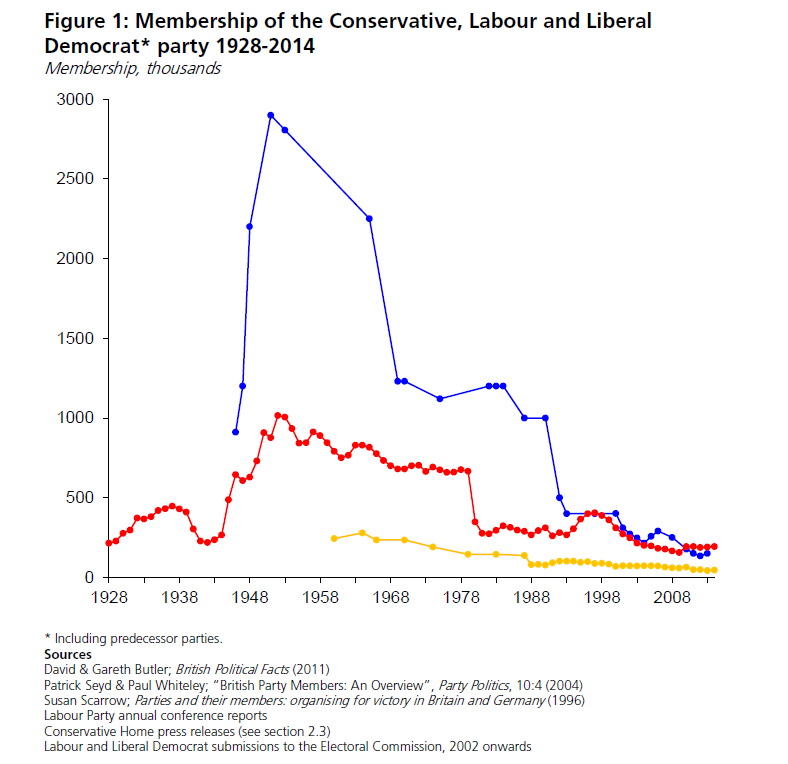 To Corbyn’s supporters, the party needs to become a movement not confined to Parliament, and the sudden surge in party membership to 450,000 and £4.6 million collected in 48 hours from the £25 fee paid by registered supporters are signs that he is the person who can deliver this. People cannot agree whether Jeremy Corbyn represents the past or the future, which certainly makes the present very exciting. But if MPs are too busy to represent us the way we want to be represented, we may all need to get more involved in politics from now on. The consultation document states that “In such a complex situation, the Government needs to listen to a wide range of opinions in order to decide what course of action we should take. We are therefore seeking views on the options and proposals set out in this paper. We would welcome both answers to the specific questions posed and also wider thoughts on the ideas discussed.” It therefore seems strange that they have chosen the period leading up to the EU Referendum to launch the consultation, when a wide range of opinions is likely to be the last thing they get. It is almost as if they are trying to bury a bad consultation. Amongst many others (only 5,945 schemes of the original 7,800 defined benefit schemes protected by the PPF remain outside). Consultation question 1: Would existing regulatory levers be sufficient to achieve a good outcome for all concerned? Yes. These levers were good enough for all these other schemes. Apparently these are not good enough for Tata Steel. Under the defined benefit pension scheme funding legislation, a sponsoring employer can chose at any time to end their relationship with the scheme – even if the scheme is in deficit. However, the employer must pay to do so. Tata have indicated that Tata Steel UK (TSUK) would not be able to make such a payment, and that this would be unaffordable. Apparently these options are not good enough for Tata Steel. The proposal would reduce the level of future inflation increases payable on all BSPS pensions in payment and deferment to a similar or slightly better level than that paid by the PPF. If adopted, this would mean that in the future existing pensioners would receive lower increases to their pensions than they would under the current scheme rules, or possibly no increases at all. Deferred members would also receive a lower increase to their preserved pension when they reached normal pension age, and would then receive the lower increases to their pension payments. This approach is not without risk – which is why it is not routinely used. Actually I am not aware it has ever been used. Although the intention would be for the scheme to take a low risk investment strategy, there is always residual longevity and investment risk, and it is possible that the scheme would fall into deficit in the future. In the event of scheme failure, the downside risk would ultimately be covered by the PPF and its levy payers. ie after all of the legislative hyperactivity for the benefit of one scheme, it could easily just end up in the PPF anyway. Question 2: Is it appropriate to make modifications of this type to members’ benefits in order to improve the sustainability of a pension scheme? No. As there is no guarantee it will improve the sustainability of the only pension scheme being considered, ie BSPS. • the individual member consents. Consultation question 3: Is there a case for disapplying the section 67 subsisting rights provisions for the BSPS in order to allow the scheme to reduce indexation and revaluation if it means that most (but not all) members would receive more than PPF levels of compensation? Ie they want to remove the need to get members’ consent before reducing their benefits. The answer is again no. This option would allow for bulk transfers without individual member consent to a new scheme paying lower levels of indexation and revaluation. A bulk transfer with consent has been used previously as a mechanism for managing exceptional problems around an employer and their DB scheme. However, the BSPS trustees have concerns about getting individual member consent to a transfer. The sheer size of the scheme means that getting member consent for a meaningful number of members would be difficult and the transfer would only be viable if enough members consented to transfer. Setting up a new scheme and transferring members to it may also need to be done rapidly in order to facilitate a solution to the wider issues surrounding TSUK – and this would be difficult to achieve in the necessary timescales if individual member consent to a transfer had to be achieved. Consultation question 4: Is there a case for making regulatory changes to allow trustees to transfer scheme members into a new successor scheme with reduced benefit entitlement without consent, in order to ensure they would receive better than PPF level benefits? No, as it would not ensure that they received better than PPF level benefits. The British Steel Pension Scheme (BSPS) operates as a trust. The scheme is administered by B.S. Pension Fund Trustee Limited, a corporate trustee company set up for this purpose. The assets of the Scheme are held in the name of the trustee company and, as required by law, are separate from the assets of the employers. The trustee board has 14 members, seven are nominated by the company and seven are member-nominated trustees. The role of the trustees is to ensure that the scheme is run in accordance with the scheme’s trust deed and rules, and the pensions legal framework. The trustees’ duties are also to ensure the proper governance of the scheme and the security of members’ benefits. Consultation question 5: How would a new scheme best be run and governed? Under trust, separate from the assets of the employer, and subject to full existing pensions law. You could probably manage with considerably fewer than 14 trustees, but these should include member nominated trustees and, probably, a professional independent trustee. Consultation question 6: How might the Government best ensure that any surplus is used in the best interest of the scheme’s members? Pensions legislation already has provisions for how to apply assets to secure full benefits for members with an insurance company and deal with any surplus that occurs (it is usually set out in the scheme rules). A surplus is a highly unlikely scenario. These regulations would disapply the subsisting rights provisions to changes made in relation to indexation and revaluation under the BSPS Scheme Rules. This would mean that TSUK can exercise the power in the existing scheme rules to reduce levels of indexation and future revaluation to the statutory minimum without member consent. We intend to make any disapplication of the subsisting rights provisions subject to certain conditions being met to ensure member protection is not further compromised. This is a terrible idea. Section 67 has protected many members from reductions to benefits they have already built up over the years. It should be maintained. These would include requiring the BSPS trustees to agree unanimously that the changes to indexation and revaluation would be in the best interests of the scheme members. We are also considering whether it may be appropriate to make it a condition that the Pensions Regulator agrees to the changes being implemented. 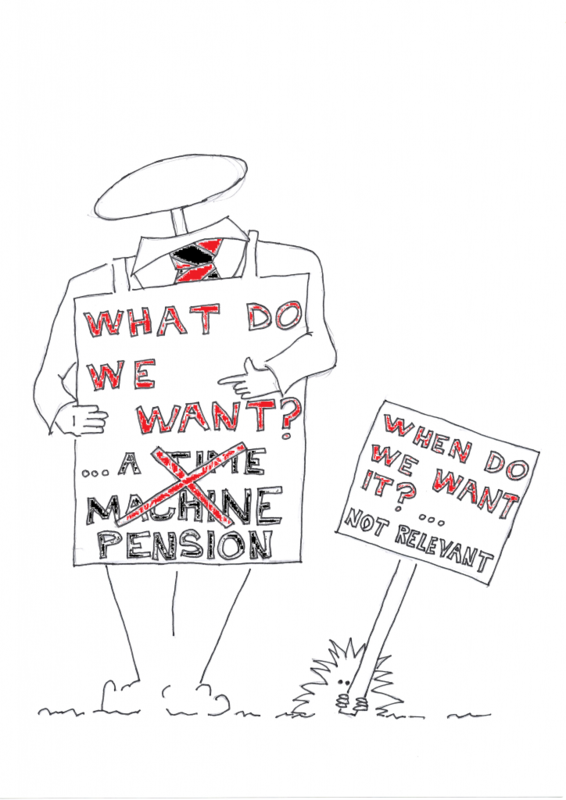 Why has the Pensions Regulator not been asked for its view already? Consultation question 7: What conditions need to be met to ensure that regulations achieve the objective of allowing TSUK to reduce the levels of indexation and revaluation payable on future payment of accrued pension in the BSPS without the need for member consent, balancing the need to ensure that member’s rights are not unduly compromised? The objective is inappropriate. Disapplication of section 67 should be abandoned. Consultation question 8: What conditions need to be met to ensure that regulations achieve the objective of allowing trustees to transfer members to a new scheme without the need for member consent, balancing the need to ensure that members’ rights are not unduly compromised. They can’t. And this therefore shouldn’t be attempted. All in all, a very bad consultation rushed out under cover of a much higher profile campaign. They plop through the letterbox about once a year. Pension statements. They tell you what your units in the various funds you are invested in were worth at some recent date (if you have a defined contribution (DC) pension – I am not talking about defined benefit (DB) pensions today as there are far fewer consequences of not making any decisions with these). They also tell you the estimated yearly pension at your Normal Retirement Date, based on the Statutory Money Purchase Illustration (SMPI) assumptions about what will happen over the intervening years, some of which are set out in the statement. However, for many it is even more scary than the bank statements they leave unopened for six months or their insurance renewals. Why is that? Human-made risks scare us more than natural ones. The basic reasoning is perhaps that natural things have been around for longer and therefore “stood the test of time”. That piece of paper with your pensions details on it is as man-made a thing as things come. 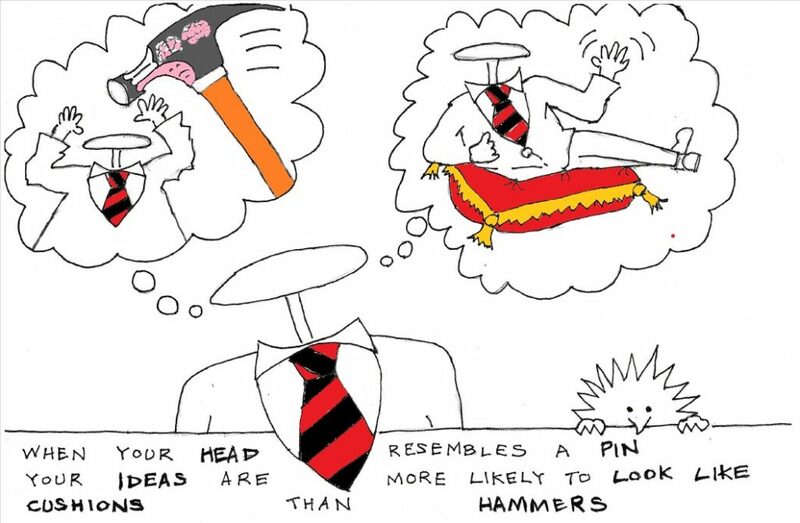 And the more that pension providers seek to make them look slick and professional, with brightly coloured diagrams and soundbites extracted from longer bits of text, the more new and untrustworthy they can seem. Ingenious ways of hedging your investment risk within a pension fund which cannot be easily explained are also likely to make it feel more “unnatural” than a more direct investment. The restrictions almost inevitably mean that you need to behave in a different way to how you would have done otherwise (otherwise the restriction would not have been necessary). This might mean you have to put more money into it than you had intended, or in a different place to where you would have chosen or have to wait longer before you can take it out again. Risks to children scare us more. Newspapers and online articles are full of stories about how much worse off our children are likely to be as a result of threats to our pensions system: whether this is the retreat of defined benefit pensions or the reform of the state pension or the collapse of capitalism. We subconsciously weigh possible harms against potential benefits. This is the one to which pensions are particularly vulnerable. The harms are immediately obvious: money that we could be spending now on things which are important to us now are instead being funnelled away into a fund to which we have no immediate access. The benefits are uncertain, particularly now most of us are in DC arrangements, even within the current set of rules governing how pension schemes operate. But on top of this uncertainty is yet another layer of uncertainty concerning how those rules might change before we get our hands on our cash. We feel powerless and at the mercy of forces we don’t understand. Keep it simple. Only introduce complexity when the benefits are obvious enough to be explained simply. More complex financial instruments may be appropriate for corporate pensions (although often they are not). They are almost never appropriate for retail pensions. Make sure every fund you offer has an easily accessible factsheet which covers what it invests in, what it is trying to do and how much it will cost. At the end of each year you should be told how much interest (why do we use different words for fund growth depending on where it is invested?) you have earned on your fund and how much you have been charged for having your money in that fund. Just like you would on your bank account. Some funds do this very well already. Keep restrictions to the absolute minimum and let everyone know about them in advance. If someone is not going to be able to take advantage of some particular aspect of the pension freedoms now available, don’t wait until they try and do so. Tell them now. Few, if any, funds currently offer this. Unfortunately there is probably not much that can be done about future pensions uncertainty. The future of the global economy is very uncertain and the UK’s economic future equally so. There is no political consensus over economic policy and the rules by which pensions are governed in the future seem likely to change in unpredictable ways over the next 30 years. But the simpler the products are, the easier they will be to regulate and the less likely they are to be affected in unforeseen ways by future changes. I have deliberately avoided the question of pensions guidance or advice. This is because I do not think that people fear pensions advice itself, they fear paying for advice that they don’t understand and then making bad decisions as a result. This is a debilitating fear which is often discussed as if it suddenly struck as an individual approached retirement. In reality it has grown year by year as people feel powerless to affect what happens to the money everyone tells them they have been paid but which they have never seen other than in this annual pensions statement when it lands on the mat. Take the fear out of that and it would change the pensions environment completely. For a brief period this week, before the Panama leaks brought everyone back in the room, one of the BBC’s main headlines was that a change to the UK State Pension was projected to make around three-quarters of people currently in their 20s and two-thirds of those currently in their 30s worse off than under the current arrangements. Figures of £19,000 and £17,000 “over the course of their retirement” were bandied around. The reason the analysis had been carried out by the Pensions Policy Institute (PPI) was that the Department of Work and Pensions (DWP) is required to carry out an impact assessment of such proposed changes and had given the PPI the task. As you can see, the numbers that came out were weekly losses of up to £17 per week for some groups and weekly gains of up to £13 per week for others. These numbers were themselves based on complicated projections about how benefit changes would be phased in and also how much the State Second Pension would pay people many decades into the future (the DWP paper can be found here). They were then aggregated by multiplying by the number of weeks in retirement until the pensioner was expected to die, based on the current State Pension Age timetable and the principal projections from the ONS 2015 Life Tables. The total amounts expected to be paid to people in retirement, however, were not (for those in their 20s this would be around 24 x 52 x 155.65 (the start rate for the new State Pension) as a minimum = £194,250 in 2015 terms). Neither was any explanation made of just how many years people were being projected to live. For £17 a week to translate into £21,000, the person currently in their 20s will need to be in retirement for nearly 24 years. It is not clear exactly when this person is expected to retire: the current tables only go up to a date of birth of 6 April 1978 (when State Pension Age is expected to be 68) with a vague intention to increase it to 69 by the late 2040s. 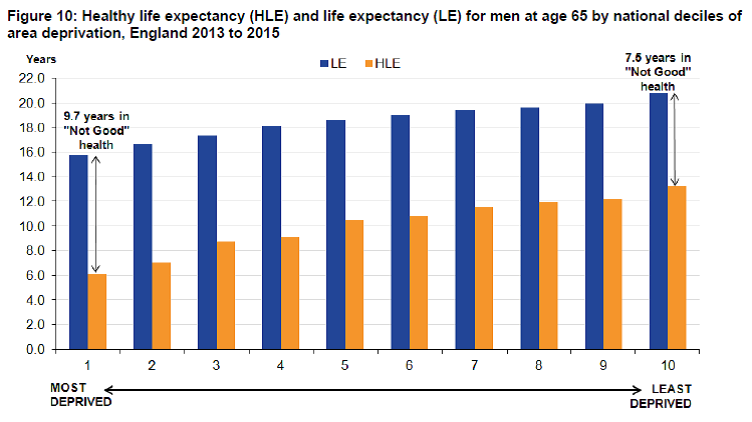 An assumption of a retirement age of 69 looks consistent with the projections, which indicate a life expectancy at that age of 22.95 years for males and 24.81 years for females born in 1995. The vast majority of people are going to be better off who retire in the next 15 years (at least in terms of their State Pension), as will most people retiring in the decade after that. Beyond that we are in the region of the unknowable – almost certainly a very different-looking world which will have required several further adjustments to state pensions before we get there. So please let’s not waste time having foolish arguments about made up winners and losers.